Oil paintings with scenes of children became popular with collectors such as John Sheepshanks and the Rev. Chauncy Hare Townshend, as well as appealing to the sentimental tastes of a very wide section of the Victorian public. The success of this painting was remarkable and led to a number of commissions for child portraits. 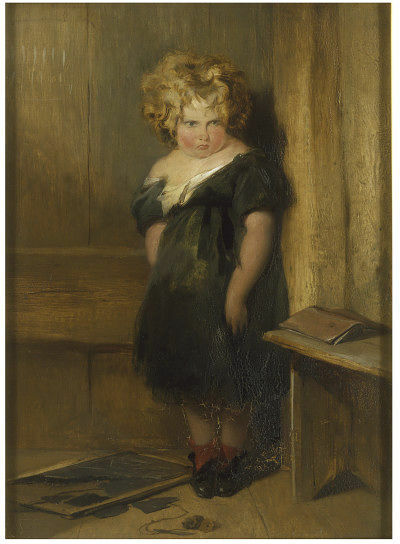 It was thought that the subject of this painting was a boy who was brought to the studio but refused to remain where he was put. His mother, exasperated, sent him to stand `in the corner' and Landseer decided to paint him as he stood. An alternative possibility is that it is a portrait of Landseer's own daughter, the second child of a liaison with Georgiana, Duchess of Bedford. It is hard to tell because of the custom of dressing young children of both sexes alike, until the boys were old enough to wear breeches. Edwin Henry Landseer (1802-1873) was a child prodigy, exhibiting some drawings at the Royal Academy when he was only 13. Queen Victoria collected his paintings as did John Sheepshanks. The two biggest collections of his work are in the Royal Collection and here in the Victoria and Albert Museum. 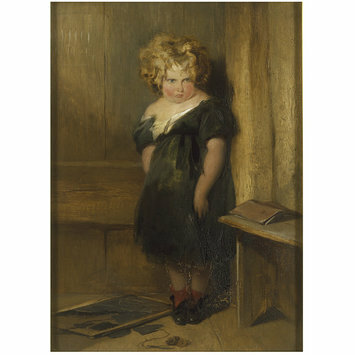 Oil on millboard depicting a full-length portrait of a child in the corner of a room, beside a broken frame resembling a blackboard in pieces on the floor. 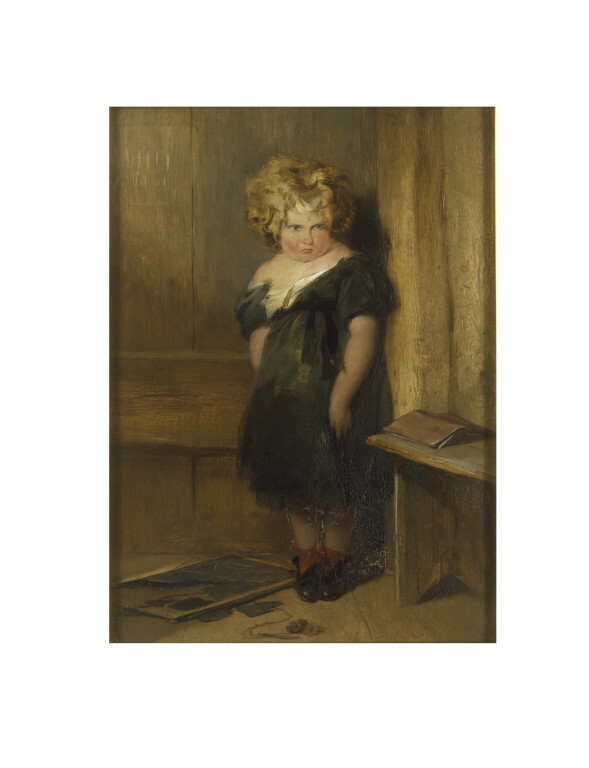 Oil painting entitled 'A Naughty Child' by Edwin Henry Landseer. Great Britain, 1834.